Who doesn’t want their kids to grow tall? I’m sure that every parent wants their child be grow tall and healthy. Yes, height of your kid largely depends on your genes. If yours and your spouse’s height is few inches above 5 feet, you can expect your child to grow at least a few inches taller than you, but your child may not become a six-footer. In this article, you can learn helpful tips on how to increase height in children. However, it is possible to ensure that your child grows to a reasonable height. With a balanced diet, exercise and correct posture, it is possible to help your child grow to the maximum possible height, all things considered. How do exercises help in increasing height? At birth, your baby approximately has 300 bones in her body. Many of the bones in your baby’s tiny body is made of cartilage, a soft-elastic tissue. As your child grows, the cartilage hardens and fuses to form the bones. When children exercise, the bands of cartilage on the long bones of arms and legs stretch. As the cartilage stretches and elongates, the bones formed later are also longer, thus resulting in a taller stature. However, shortly after puberty (between 16-18 years of age), this cartilage fuses and does not allow the bones to grow anymore. Hence, it is important for children to start exercising from a young age to become tall. Giving a balanced diet to your child is the most important step to increase your child’s height. A balanced diet should include healthy carbohydrates, proteins, and healthy fats. Add plenty of lean proteins in your child’s diet such as chicken, egg, paneer, soy, fish etc. Include green and leafy vegetables like spinach, fenugreek leaves and dairy products like milk, curds, cheese etc. in the diet to get an adequate amount of calcium for bone growth. Yes. Without exercise, there is no way your child’s height is going to increase. Your child’s exercise routine should include cardio-workouts like running, cycling, swimming, skipping etc., stretching exercises and hanging exercises. Ensure that your child consumes carbohydrates before exercising, stays adequately hydrated during exercise and eats protein-rich foods after workouts. Your child’s skin has to be exposed to sunlight so that the body can make Vitamin D. Vitamin D is essential for children to absorb calcium, which enhances bone development and growth. Allow your child to play out in the sun often. Do not use too much of sunscreens or sun protectors. Yoga is not just for physical well-being but also for emotional, mental and spiritual well-being. Yoga poses makes your child’s body stretch completely and thus, helps in the growth. Yoga poses like Suryanamaskar and Chakrasana (Circle Pose) are very beneficial for increasing height in children, as the entire body stretches while doing the poses. A sound sleep of at least 8 hours is very much essential for the growth of your child. During sleep, growth hormones are produced which aid in increasing the height of your child. A good posture is important to grow taller. Ensure that your child walks erect and sits straight all the time. Walking with a hunched back or sitting in a crouched position will make the spine grow crooked or bent. Though family environment may not have a direct influence on the height of your child, negative environment at home can cause lot of stress to the kids and stunt their growth. 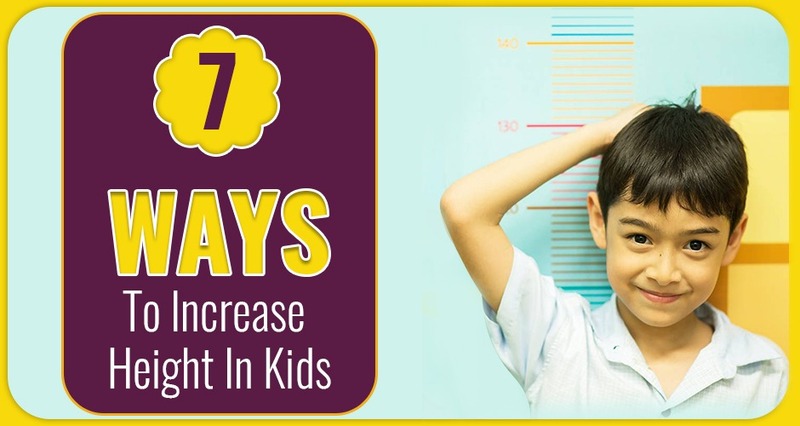 Dear Parents, following all the tips listed above ensures that you are doing all the right things to ensure that your child grows taller, but do not expect miracles to happen immediately. Also, the height that your child reaches is determined by heredity factors also. Also, please do not give any “magic” pills or medicines that claim to increase height, as advertised on TV or print media. They are ineffective and are non-prescribed drugs, which may cause complications. Though there are many products promoted on TV such as additives to milk, which claim to provide complete nutrition as well as increase height, there is no substantiated proof that adding them to your child’s glass of milk can replace a well-balanced diet. A balanced diet and regular exercise is the only way your child can grow healthier, stronger and taller. If all these tips on how to increase height in children, your child will definitely be a tall child.